Subject: Fractured femur with a cyst? A male 17 years old fallen while usual walking. Images attached combining common and detailed view of the fracture area. The images show something like a bone cyst. So the question is about preferred method of treatment. Can nailing be an option here? Or we should avoid any touch of the focus and use ex-fix only? Is biosy strongly needed? I would also greatly appreciate any common reference to a systematic review or common guide on surgical management of fractures over cysts, fibrous displasia etc. This is a case of a femur shaft fracture through a bone cyst, presumably a simple cyst and poses the excellent question of where is a good reference to fractures through benign focal lesions. I, too, would like a citation of a good reference. The topic Pathological Fractures has 3 subtopics: Fractures through malignant lesions, Fractures through benign lesions and Fractures in metabolic bone disease. Our text Skeletal Trauma has chapters regarding fractures in metabolic bone disease and malignancy but NOT benign lesions. The text by Resnick and Niwayama "Diagnosis of Bone and Joint Disorders" mentions fractures and treatments but only peripherally. Same is true for Rockwood & Green, Evarts and most other texts that I reviewed. Hopefully Bill Burman or someone else will have a good reference for this topic. I would biopsy this lesion at the time of fixation to make certain it's a benign cyst but I would NOT consider it essential to do the biopsy since it looks so classic on xray. I recall an article from circa 1980 that suggested simple bone cysts greater than 5 cm in greatest diameter were prone to fracture in the tibia and "should" be treated prophylactically AND the same lesions with (big) that did fracture didn't heal so well without operative treatment and "should" be fixed. I would put my money on non-ossifying fibroma, and most likely go ahead with curettage/biopsy at time of ORIF (fx looks like a great indication for a blade plate to me). As long as my frozen section was consistent with NOF (or similar benign fibrous lesion) I would probably "fill" lesion with commercially available bone graft material such as INTERPORE or Osteoset if you like. Arata et al. Pathological Fractures Through Non-Ossifying Fibromas: Review of the Mayo Clinic Experience. J Bone Joint Surg 1981;63-A:980-988. Dorfman HD & Czerniak BC. Fibrous & Fibrohistiocytic Lesions. Chapter 9 IN: Bone Tumors. 1st edition Mosby. St Louis. 1998. TAD> fractures through benign focal lesions. I, too, would like a citation of a TAD> good reference. Kinderchirurgische Klinik, Dr. v. Haunersches Kinderspital, Universitat Munchen. Pathological or spontaneous fractures in childhood are rare and are mostly caused by benign bone diseases; the fractures must be treated on an individual basis, as there are no constant rules. 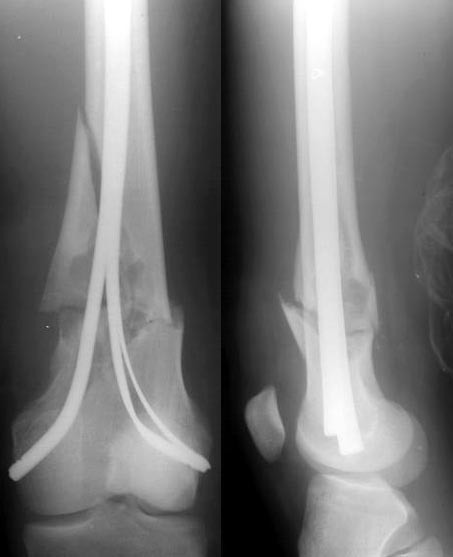 Since the new method of osteosynthesis called "elastic stable intramedullary nailing" (ESIN) or "embrochage centro-medullaire elastique stable" (ECMES) has demonstrated the best results in the treatment of normal fractures in childhood, this method is rapidly being used in the treatment of spontaneous or pathological fractures. We report our experience in the treatment of spontaneous fractures in childhood with "elastic stable intramedullary nailing", in nine patients with ten fractures. The pathological diagnosis was in 5 cases a juvenile bone cyst; in addition, there were cases of histiocytosis X, lymphangiomatosis, hemangiomatosis and osteoporosis (one each). The location was the femur (two cases) and humerus (seven cases). All fractures healed completely without pseudarthrosis; as complications we saw one incidence of osteomyelitis, one of a second fracture after "elastic stable intramedullary nailing" and one coxa vara in a child with histiocytosis X of the proximal femur. In the 5 children with juvenile bone cysts the nails are still in situ; in two cases the nails had to be changed. I think your options for repair are plating (with a blade plate or DCS type device) vs. IM nailing. Knowing your expertise with Ilizarov devices, I suppose you might chose that as well. I think this cyst (that's what it probably is) will heal better if you bone graft it at the same time. I think I would use autologous graft instead of a graft substitute. The smartest orthopaedic oncologist I know says you should biopsy every lesion, because you never know what you're dealing with until you look at it under a microscope. He also said that osteogenic osteosarcoma is good at mimicking other lesions. This could be an osteosarc. It probably isn't, but it could be. The diagnosis of sarcoma would change your management. So, whatever you choose to do to stabilize the lesion, I'd biopsy it first. I'm not aware of any review of the treatment of fractures through benign lesions. I'll look. AS> I think your options for repair are plating (with a blade plate or DCS type device) vs. IM nailing. Knowing your expertise with Ilizarov devices, I suppose you might chose that as well. The patient is from another town so we don't want to tie him to the clinic using an ex-fix which requires qualified control for all the period of healing. AS>I think this cyst (that's what it probably is) will heal better if you bone graft it at the same time. There is a good article in JBJS 2000 (Roposch et al, JBJS 82A:1447) about nailing in bone cysts. Today i nailed the femur, will post images tomorrow. Biopsy was taken. The fracture was fixed yesterday with some retrograde flat titanium nails. I tried to insert a pair of thick ones, but it resulted with fragmentation of the medial cortex above the fracture so i replaced the lateral one with two more thin plates. Fixation is stable under image intensifier. Biopsy was taken. Images attached. As you can remember we discussed a case of distal femoral fracture through cyst-like bone lesion. We performed closed nailing there and then had some internal discussions between different units of the institute. Morphologists preliminary stated that it is non-ossyfying fibroma, and excluded any malignant process. And today a next 16 y.o. male admitted to us with similar fracture pattern, but with a small focus, radiologists (and we independently) recognized the lesion as fibrous cortical defect. So question is - how criminal and/or dangerous is closed nailing in the fibroma, and fibrous cortical defect? Should the lesion be anyway excised/curetted and grafted? When biopsy should be performed? Should we have definitive morphological conclusion before the surgery? When you first presented this case, Tom DeCoster called for references and Charles Mehlman provided a substantial one i.e. Arata et al. Pathological Fractures Through Non-Ossifying Fibromas: Review of the Mayo Clinic Experience. J Bone Joint Surg 1981;63-A:980-988. (23 cases collected over 50 years). "... If the fracture is unstable and cannot be acceptably aligned by closed means, it should be curetted and grafted at the time of open reduction and internal fixation." An interesting problem. The fracture is displaced and is really unacceptable in its current state. Fractures through NOFs heal OK and sometimes make a lot of the lesion disappear. However, there is an interesting axiom about orthopaedists which is true of this case. We are very good at treatments of single disorders, but when you put two together, we have problems. We are very good at fractures....we are very good at treating NOFs ....but when the two occur together our capabilities at management of the entire picture decline markedly. So if the fracture was undisplaced or could be reduced closed, we would treat it by letting the cortex heal and if there was still a defect in the bone related to the NOF at some point some months later, curette it out and fill it with allograft chips (better then auto, which may be eaten up by the lesion!). If the fracture is displaced and can't be reduced closed, we should do an open reduction and reduce it with some hardware to hold it and then later on do the curettage and packing of the NOF. It is a little bit crazy to try to treat both things at the same time and the results may be bad!" Your question now about the safety of closed nailing in such a situation is difficult. Biopsy in the region of a healing fracture can be confused with malignancy - but one can't permit the fracture to heal in an unacceptable position. Adam Starr mentioned never being absolutely sure about malignancy. I had a bad experience once with closed antegrade nailing of a distal femur fracture through pagetoid bone. Could not tell that the fx was secondary to malignant degeneration. The nailing led to an unresectable osteosarcoma at the hip. Looked like a huge mushroom cloud coming out of the proximal end of the nail. Perhaps the absolute safest thing is a local ORIF or ex fix.